Guam is the largest and southernmost of the Mariana Islands in the northwestern Pacific Ocean. Spain colonized the island in 1668 and controlled it until U.S. forces captured it during the Spanish-American War in 1898. During World War II Guam was occupied by Japanese forces from late 1941 until July 1944, when it was recaptured by American forces in bloody fighting. There are no traditional lighthouses today in Guam, but the island does have a very poorly known lighthouse history. There are two obvious sites for lighthouses. Orote Point, on the west side of the island, is a steep promontory marking the entrance to Apra Harbor, the island's only protected anchorage and port. Ritidian Point, at the northern tip of the island, features a precipitous cliff looming over a sandy beach. Spain built a small lighthouse at Orote Point sometime in the late 1800s. There are no images of this lighthouse available and it has vanished completely. At Ritidian Point the U.S. built a lighthouse of some kind in 1932. Again, no images are available. Probably this lighthouse did not survive World War II. Today ordinary post lights are in place at both locations. Does anyone have photos of the Ritidian Point lighthouse, or has anyone seen images of the Spanish lighthouse at Orote Point? if so, please share what you know! ARLHS numbers are from the ARLHS World List of Lights. Admiralty numbers are from volume M of the Admiralty List of Lights & Fog Signals. U.S. NGA List numbers are from Publication 111. USCG numbers are from Volume VI of the U.S. Coast Guard Light List. Nautical charts for the island can be viewed online. Chart 81048 covers all of Guam and chart 81054 covers Apra Harbor. Date unknown (station established 1932). Active; focal plane 175 m (573 ft); white flash every 6 s. 6 m (20 ft) white post light. The tower also carries a black and white, diamond-shaped daymarker. Selena Hoy's distant photo appears above. Bing has a satellite view of the site. Pete Payette writes that a lighthouse was built here in 1932 but was destroyed during the war; according to Michel Forand a 1933 U.S. Lighthouse Service list describes this as a 13.5 m (44 ft) skeletal tower, and the same light appears in a 1937 French light list for the Pacific. The modern light stands on the concrete foundation pad of the 1932 lighthouse. In 1993 the Navy transferred 385 acres at Ritidian Point to the Fish and Wildlife Service as the first unit of the Guam National Wildlife Refuge. 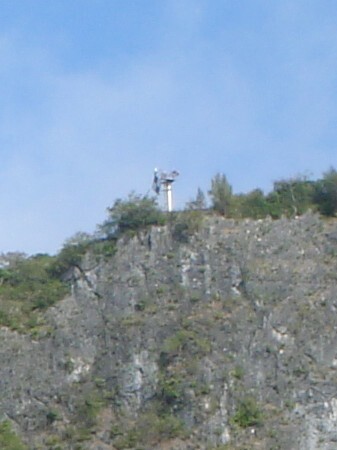 Located high above the northernmost point of the island. There is a road to the light but it is probably closed to the public. Site probably closed. Site manager: U.S. Fish and Wildlife Service (Guam National Wildlife Refuge). Admiralty M8382; NGA 10981; USCG 6-30660. Date unknown. Active; focal plane 18 m (59 ft); white flash every 4 s. 8 m (26 ft) steel post mounted on a concrete pad; the post carries diamond shaped daymarks painted in a black and white checkerboard pattern. A photo is available, Lightphotos.net has a closeup, and Bing has a satellite view. The Glass Breakwater encloses the north side of the entrance to Apra harbor. Built shortly after World War II, it is named for Captain Henry Glass, captain of the U.S. cruiser Charleston, which captured Guam from the Spanish in 1898. Located at the end of the breakwater; accessible by road. Site open, tower closed. Admiralty M8386.2; NGA 10984; USCG 6-30710. Date unknown. Active; focal plane 20 m (66 ft); green light, 3 s on, 3 s off. Approx. 17 m (56 ft) triangular cylindrical skeletal tower carrying a rectangular daymark painted red with a white vertical stripe. Google has a street view, and Bing has a satellite view. The front light is on a post. Located on a peninsula opposite the Guam Port Authority terminal on Cabras Island. Accessible by road, but it's not known if the road is open to the public. Site status unknown. Admiralty M8386.1; NGA 10983.1; USCG 6-30705. Date unknown (station established 1929). Active; focal plane 69 m (226 ft); white flash every 5 s. 7 m (23 ft) white concrete post light. The tower also carries a black and white, diamond-shaped daymarker. No closeup photo available, but there's a view from the sea below, the tower can be seen in a distant photo of the point, Lightphotos.net also has a distant view, and Google's satellite view shows the nearby communication towers. Spain built a small lighthouse on Orote Point late in the 1800s, according to Part B of the National Park Service's report Archaeology and History of Guam. Nothing remains of this tower. Apparently it did not survive long, since a Secretary of the Navy report in 1904 lamented the lack of a light on Orote Point. There is a popular overlook on the point very near the light. In 1987 Congress renamed the point for former Arizona congressman Morris Udall, but most residents still call it Orote Point. Located atop a steep bluff on the south side of the entrance to Apra harbor, on the southwestern side of the island. The area is a U.S. Navy reservation but is generally open to visitors with proper identification (driver's license, car registration, and insurance). Site open, tower closed. ARLHS GUM-001; Admiralty M8384; NGA 10982; USCG 6-30685. Posted July 24, 2008. Checked and revised February 21, 2019. Lighthouses: 1. Site copyright 2019 Russ Rowlett and the University of North Carolina at Chapel Hill.